Hermann Schmitz, pictured at the zenith of his career as president and chief executive officer of I. G, Farben, which was Germany's greatest source of foreign income during the Hitler years. 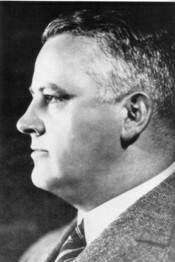 Schmitz was a confidant and adviser to Martin Bormann. He was the principal architect of Farben's program of camouflaging its vast over­seas holdings under Bormann's direc­tive to find safe havens for German capital. During the period when Nazi excesses against Jews accelerated, Hermann Schmitz found places for I. G. Farben Jewish corporate officials and lesser staff members in Farben's foreign offices, particularly in South America.